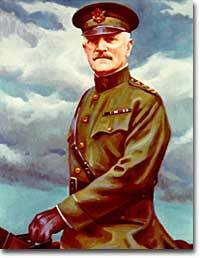 General John J. Pershing's insistence on retaining control of his American "doughboys" led to increased morale among the troops. This move spelled defeat for Germany, as the Allies were able to force an armistice on November 11, 1918. The United States was developing a nasty pattern of entering major conflicts woefully unprepared. When Congress declared war in April 1917, the army had enough bullets for only two days of fighting. The army was small in numbers at only 200,000 soldiers. Two-fifths of these men were members of the National Guard, which had only recently been federalized. The type of warfare currently plaguing Europe was unlike any the world had ever seen. The Western front, which ran through Belgium and France, was a virtual stalemate since the early years of the war. A system of trenches had been dug by each side. Machine-gun nests, barbed wire, and mines blocked the opposing side from capturing the enemy trench. Artillery shells, mortars, flamethrowers, and poison gas were employed to no avail. The defensive technology was simply better than the offensive technology. Even if an enemy trench was captured, the enemy would simply retreat into another dug fifty yards behind. Each side would repeatedly send their soldiers "over the top" of the trenches into the no man's land of almost certain death with very little territorial gain. Now young American men would be sent to these killing fields. George M. Cohan's "Over There" was one of the most popular songs of the World War I era. The first problem was raising the necessary number of troops. Recruitment was of course the preferred method, but the needed numbers could not be reached simply with volunteers. Conscription was unavoidable, and Congress passed the Selective Service Act in May 1917. All males between the ages of 21 and 30 were required to register for military service. The last time a draft had been used resulted in great rioting because of the ability of the wealthy to purchase exemptions. This time, the draft was conducted by random lottery. By the end of the war, over four and a half million American men, and 11,000 American women, served in the armed forces. 400,000 African Americans were called to active duty. In all, two million Americans fought in the French trenches. The first military measures adopted by the United States were on the seas. Joint Anglo-American operations were highly successful at stopping the dreaded submarine. Following the thinking that there is greater strength in numbers, the U.S. and Britain developed an elaborate convoy system to protect vulnerable ships. 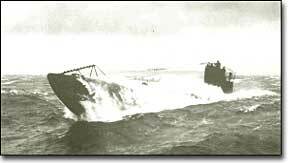 In addition, mines were placed in many areas formerly dominated by German U-boats. The campaign was so effective that not a single American soldier was lost on the high seas in transit to the Western front. The American Expeditionary Force began arriving in France in June 1917, but the original numbers were quite small. Time was necessary to inflate the ranks of the United States Army and to provide at least a rudimentary training program. The timing was critical. When the Bolsheviks took over Russia in 1917 in a domestic revolution, Germany signed a peace treaty with the new government. The Germans could now afford to transfer many of their soldiers fighting in the East to the deadlocked Western front. Were it not for the fresh supply of incoming American troops, the war might have followed a very different path. The addition of the United States to the Allied effort was as elevating to the Allied morale as it was devastating to the German will. Refusing to submit to the overall Allied commander, General John Pershing retained independent American control over the U.S. troops. The new soldiers began arriving in great numbers in early 1918. The "doughboys," as they were labeled by the French were green indeed. Many fell prey to the trappings of Paris nightlife while awaiting transfer to the front. An estimated fifteen percent of American troops in France contracted venereal disease from Parisian prostitutes, costing millions of dollars in treatment. The African American soldiers noted that their treatment by the French soldiers was better than their treatment by their white counterparts in the American army. Although the German army dropped tempting leaflets on the African American troops promising a less-racist society if the Germans would win, none took the offer seriously. A German "unterseebooten" — or "U-boat" — surfaces. Until the Allies could successfully deploy mines to neutralize these German submarines, the U-boats destroyed many Allied ships and brought terror to the sea. By the spring of 1918, the doughboys were seeing fast and furious action. A German offensive came within fifty miles of Paris, and American soldiers played a critical role in turning the tide at Chateau-Thierry and Belleau Wood. In September 1918, efforts were concentrated on dislodging German troops from the Meuse River. Finding success, the Allies chased the Germans into the trench-laden Argonne Forest, where America suffered heavy casualties. But the will and resources of the German resistance were shattered. The army retreated and on November 11, 1918, the German government agreed to an armistice. The war was over. Over 14 million soldiers and civilians perished in the so-called Great War, including 112,000 Americans. Countless more were wounded. The bitterness that swept Europe and America would prevent the securing of a just peace, imperiling the next generation as well. Check out these photos by an American soldier stationed in France during WWI! This site devoted to aviation in World War I is exceptional. Check out the extensive lists of biographies of the greatest pilots of the day and detailed descriptions of the aircraft they flew. Go to the Forum to eavesdrop on the interesting conversations or to ask your own questions. Yes, there are lots of images! Another excellent megasite on World War I, but with a difference. This British site is loaded with probably hundreds of illustrated articles and biographies, with lots of inline links to related articles. A fantastic resource, if you remember that when they say "homefront" they're don't mean America! The "War to End All Wars" did no such thing. The author of this website calls World War I "a senseless slaughter that set the stage for the bloodiest century in human history" and dedicates the site to "those on all sides who were sacrificed for nothing in this terrible tragedy." The section "Poets and Poetry of the Great War" is outstanding, but keep some tissues handy. You'd need a time machine to find more information about World War I than is on this immense website. This page offers selected tours of the site, such as "The Soldier's Experience," "Life on the Homefront," and "Documenting the Great War," but click on the "Library" icon for direct access to general categories, such as weapons, biographies, timelines. Lots of images are just a click away. German U-boats changed the nature of naval warfare. Before 1915, the object was to capture enemy ships and their crews. In February 1915, the German government began using their submarines to sink other vessels, crews and all. This site tells the story with a few excellent pictures and excerpts from the diary of a U-boat commander. 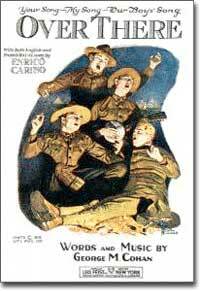 Check out these RealAudio and midi selections of World War I music. Outstanding! What "climbed like a monkey and maneuvered like the devil," in the words of the "Red Baron" Manfred von Richthofen? It's the Fokker DR.I triplane.